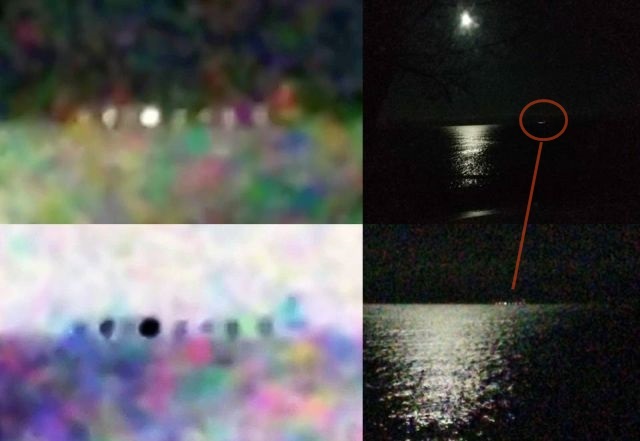 The witness has taken several photographs of a disk-shaped UFO with port holes that according to the photographer goes in and out the water of Lake Michigan known for its many mysterious UFO sightings. On the night of March 31st 2018, about 10:20pm, it was a very clear, calm night with a bright full moon. I was driving along the coastline from Kewaunee to Algoma when I noticed a very long, brightly lit ship. I initially thought it was a cargo ship. But the more I watched it, the more erratic the movements and lights became. 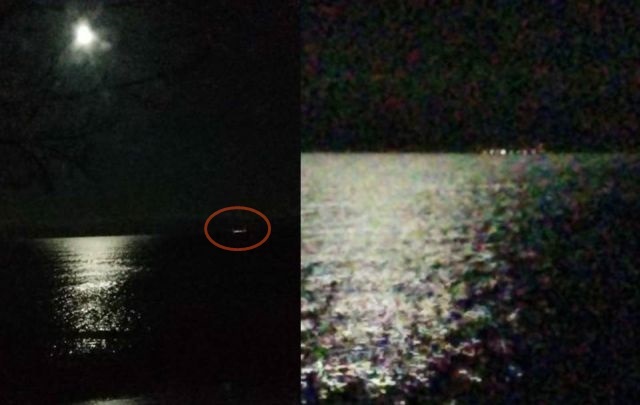 I decided to park at a local wayside right before entering Algoma, that overlooks the water of Lake Michigan where this UFO is. I can now see it flashes different patterns of lights all long it's structure. The shape seemed to shift between a long rectangular object to a disc shape object. The colors would vary from bright white, red, green, white blue, lights. It made a couple sharp turns than would correct itself on what seemed to be a Northeastern path. It would sporadically hover over the water than seem to land on the water all the while gradually going northeast. Then, when it seemed to have been completely aligned with my vehicle (maintaining a good mile out or less distance in front of me), all the electronics, my vehicle radio, dashboard lights, headlights, cell phone turned on by themselves bright and loud. After about 3 seconds they all suddenly turned off at once. I took that as my sign to take off. I sat there another few minutes, trying to calm myself and locked my vehicle doors (out of instinct). After I got my wits about me, I left with the UFO still just meandering on it's way over the water going northeasterly.